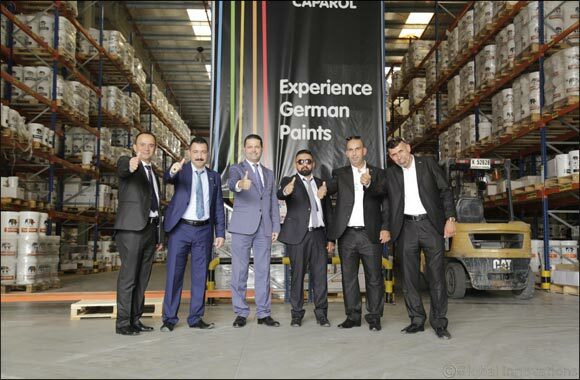 Dubai, August 19, 2018: Caparol Paints, the German leader in the global paints industry, recently signed strategic partnership agreements with a number of contractors from Iraq to increase its market reach in the country. Caparol hosted contractors from various parts of Iraq to provide them with firsthand experience of Caparol’s paints and techniques. This is part of Caparol’s growing interest in the region and increasing its reach across the Middle East. The contractors were given insights on various Caparol paint techniques, the strength of the brand and the paints that will be ideal for the Iraqi market. With the aim to market Caparol across Iraq, Caparol will also participate in an industry event scheduled to be held in November. Caparol aims to showcase its products to a larger audience in Iraq. Caparol products including Dibson, Texture and Stone were showcased to the contractors from Iraq. They were also provided training to understand the different decorative paints and uses including ArteTwin, Makhmalia, Armareno, DecoLasur, ArteLasur, Stucco Di Luce and Metallocryl interiors. Speaking about expanding Caparol’s reach into Iraq, Mr. Mowaffaq Balish, Commercial Director Middle East at Caparol Paints, said, “It was a pleasure to host the delegation from Iraq. As we aim to increase our reach in the Middle East, Iraq has been our major focus. We aim to penetrate the market further and carve a niche for ourselves. Our growth in the UAE has helped us explore various other markets in the region and hosting the contractors has been an extremely important step in reaching out in the Iraqi market”. “At Caparol we focus on knowledge sharing and its importance for growth. Our understanding of the interiors and paint industry in the UAE and Middle East has only grown stronger over the years. Through this exercise we have also educated them on the various paints we have at Caparol and its applications. Having developed our product range in-house with an up-to-date research and development team, we believe that providing insights into the industry to our peers is a great opportunity for us”, he added. “Our interest in the region lies in being able to reach across markets and providing our paints and expertise to the interior and paint industry. Our highly efficient paints are a result of our commitment to provide the best in the industry to the people. We hope to further strengthen our relations with contractors in Iraq and increase our reach”, Mowaffaq said. Caparol Paints has always been at the forefront of innovation with a highly sophisticated research and development department that constantly innovates technologies and manufacturing techniques, which complement the local market conditions. Through its range of products, Caparol brings German paint techniques while focusing on appealing colours and paint textures. The brand has also made headway in sustainability by paying attention to quality and balancing between economy, environmental capability and quality of life.